There are a few reasons to celebrate this week. Cleverman has returned to our screens and it’s NAIDOC week. We caught up with Cleverman creator, Ryan Griffen to find out what he’s been up to recently. Firstly, can you share with us what NAIDOC Week means to you? For me it’s a week of acknowledging and celebrating our culture, and supporting each other in whatever fields we may be in, whether it be in teaching, medicine, music, whatever. It’s about supporting the culture, each other, and acknowledging where we’ve come. What will you be doing over NAIDOC Week? I’ll go to a few things – some small events here and there. We’ve got a whole lot of work to do with Cleverman, so I’ll be working on that as well. Talking about the work you’ve got to do, Cleverman is a phenomenal series and you’re its creator. What’s it like to see your idea now coming into its second series, screening both in Australia and internationally? It’s amazing how far the show has come. Getting the story out internationally is a huge achievement for the team; I feel it’s great having the stories of Cleverman told around the world, even getting our people seen in different countries. 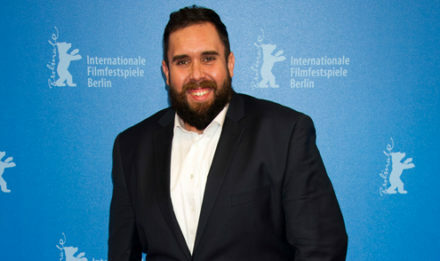 It’s exciting that we can try and not only change the way that Aboriginal stories are told in this country, but how stories in general are told, and hopefully, for me, it’s also about bringing a bit of genre back into this Australia, and trying to make television that’s outside the box. It’s very exciting coming into a second season, because we get to push the boundaries even further, and also concentrate a lot on our characters, more than we got to in the first season. Now we don’t have to set up the Cleverman world again; it’s already established, so we get to really play in the genre, we really get to play in the personal character journeys. You mentioned that Cleverman is something of a new genre for Australian audiences. In a recent interview Hunter Page-Lochard said international audiences are “already trained for this kind of drama”. What are your thoughts on how the audience and community might engage with the second series now? With any series, the more that you get to see how the characters interact within their world, the more you start to connect yourself to them; you start to feel for them; you want to go on the journey further with them. So having the ability to go on another six-episode journey with those characters is just going to help enhance our audience interaction with the characters and their journey. I think in a way, Hunter’s right: there is a sense of a lot of the Australian audience isn’t connecting to genre in this country, or even connecting to Australian and especially Aboriginal stories in the way that an international audience have. We found that you first make a splash overseas, then you start to get the recognition here, which is a bit of a shame, but like I said, the more that we get to build our world and take our characters on bigger journeys, the more people will connect to them. Cleverman certainly has connected well with international audiences, including critical acclaim and nominations in several international markets and competitions. One example I’ve read recently was that German audiences were really connecting with the refugee storyline in the script. Are there any other storylines that are being picked up by other countries that maybe you didn’t expect? First and foremost, it was always a pre-colonisation story for me, especially in the first season; the second season is more about assimilation, and the expectations placed on people to fit into whatever the norm may be. In both the UK and the US, the audiences are all connecting – they connect to the theme of oppression. That’s the one thing that makes us universal. What makes it unique is that we’re telling Aboriginal stories on this sort of scale and in this genre world, but what makes us relatable throughout the world is how we deal with other people and the oppression there. And unfortunately, there are so many countries that have had that, whether it be dealing with another race, or dealing with sexual orientation or refugees – there’s always the ability to connect to something as an outsider. The world has changed in the time since you first imagined Cleverman, what must have been over five years now. Has that time given you opportunity to look back and refine things to reflect the world we’re living in now? No, there’s always moments where you look at certain political issues in the world and find ways to connect them into the story, but unfortunately around the world at the moment, we seem to be repeating history. These are big events and it’s not like they haven’t been seen before. Racial divide and that sort of thing is more prevalent now as it was back in the 60s and it feels like we need to use the medium of storytelling to help shine a light on that, and hopefully open a few eyes. Cleverman is certainly a game-changing series. It has also upskilled a generation of Aboriginal creatives both in front and behind the camera. Through the series Create NSW was able to support a group of attachments in different roles. Can you tell me what’s come about on those opportunities? It’s important to keep supporting the industry and even more to support black talent throughout this country by getting more people involved. We’re doing it on screen, we’re doing it in the writers’ room, and we need to do it for our emerging practitioners, so allowing attachments to be involved across departments – we had make up, we had attachments in the art departments, assistant directing, all those areas. It helps bring that younger talent up and it’s great to walk on a set and see so many blackfellas involved in a show like this, and wanting to do not only the best for the show, but to learn and grow. It’s kind of like a big family on set. The series makes use of many existing talents such as Wayne Blair, Jacob Nash and Leah Purcell, who both return for this season. Working with all these people again did you have you have a chance to look at what worked really well in season one, and change things for season two? The number one thing you’ve gotta do whenever you’re making something is watch it back – you remember the things that worked, the things that didn’t and the things that were harder to achieve and we’ve definitely taken all that on board this season. I feel like we have a smarter season across everything – across our scripts, across the look of it; our actors know the characters, who they are, and are driving them in a way. It felt a lot smoother in the things that we wanted to achieve and put on the screen this time. It’s well known now that your son was a real motivator for you creating this series, so that he could watch superheros that he could relate to. What did he think of the first series, and has he seen the second? He hasn’t seen much of the second. We have him out on set every once in a while, and he engages in it quite a lot. The number one thing was to empower him. He’s a big WWE fan, and there was a time last year, after the first season had aired, when I walked into his room and he had the Cleverman theme music playing and he was wrestling with the pillows, and it was because his wrestler was called the Cleverman. That was his music to enter the ring. It hit the nail on the head for me – we’re wanting to empower our younger generation in any way it may be to make them feel proud to be black, and that’s exactly what it was doing for him. In that way it sounds like you do feel that Cleverman is starting to change the creative status quo, and push boundaries of what stories can be told. Look, I hope it is. I think we’re in a whole new time of consuming film or television. Our audiences are smarter than ever before with watching content, and I feel that we as the Australian community need to push it, we have an opportunity to do that. We’ve got great writers – we have great practitioners across the board in this country, and we can really compete on the world stage. You’ve also recently launched a Cleverman comic. Can you tell us about it? The comic’s a big thing for me. I’ve grown as a reader and writer through comics, and it’s very much in the world that our audience for the show Cleverman sit in, so it was great to adapt a story for it. The comic actually follows a few different characters than the TV series does. It’s a bit of a prequel to the first season, but it introduces characters that are involved in the second season, and the first, and it fills in a few holes that people might not know from the first season. It’s quite fun playing in that space, because it is a different form of storytelling, but it’s really fun. In Sydney we’re selling it at Kings Comic in the city. You can also get the comic on our publishers’ website, Gestalt. Hopefully more and more comic book stores will be picking that up around Australia. Aside from Cleverman do you have any new ideas in the pipeline? I’m starting to shop around an idea that I’ve been working on – two ideas: one’s a series and one’s a film. And it’s just quite exiting to step outside the Cleverman world and work on something different. They’re both high concept genre ideas again. That’s kind of the space that I want to keep playing it. It’s the reason why I joined the industry, so trying again to just keep pushing the boundaries of what we can do in this country. Since you’re into high concept ideas, I wanted to ask you if you if you could work with anyone in the industry, Australia or overseas, who it would be, and why? That’s a hard one. I’d like to sit in a writers’ room with Stephen King, if I was to pick anyone. He has the ability to transcend genre. He can do some amazing dramas, like Stand By Me, or Shawshank, and then also go into real horrors like It. It would just be interesting to see how he works as a writer and how he structures and goes on his journey to create the stories that he wants to tell. For all of our Aboriginal practitioners, emerging practitioners, who’ll be reading this article, what advice do you have for them around getting ahead in the industry or voicing their ideas? You’ve just got to be persistent in this industry. Find whatever that first door is to get into and sort don’t expect things to happen within a year or two. It is a journey; it’s an industry where you continuously learning, and you should always keep trying to learn. It’s about being persistent, and at the same time, it’s about being thick skinned throughout that process, because you’re going to hear a lot of nos, or you’re going to get knocked back a lot of times before you get what you want or even get your opportunity to show what you want to do. Make sure that you know what your own goal is, and keep pushing for that end goal. I’m very proud of this season of Cleverman, I think it’s a lot stronger than the first and it’s definitely shown on screen, so I’m just looking forward to getting it out there. Cleverman airs on Thursday nights at 9.30pm on ABC.